The is becoming a pleasure not a chore. 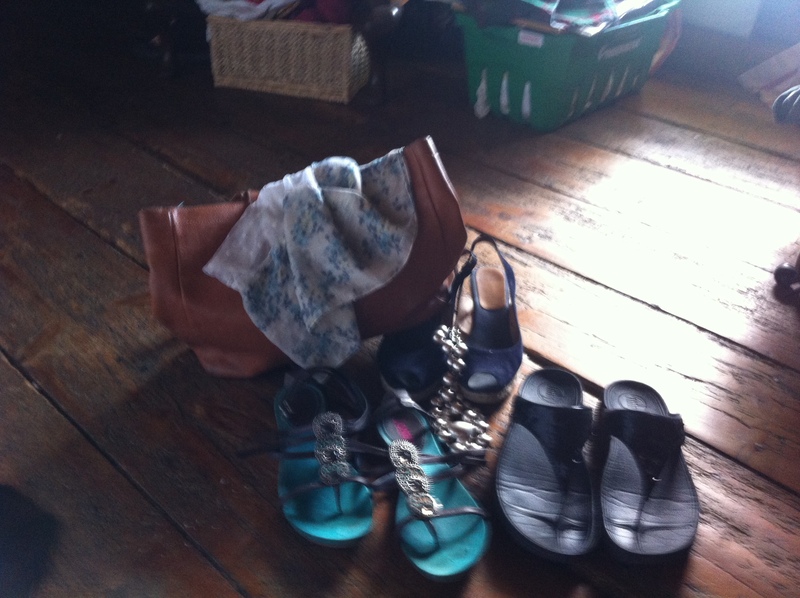 When I went out to work I would always put my clothes out, including shoes and jewellery out the night before. Some nights I would panic and just grab one of my standard outfits just so that I didn’t have to think about it in the morning. These days I don’t have to dress up for work, but I do have to dress! It is always easier in the summer, a single dress, underwear and sandals and hey presto. Winter requires more planning because it requires more clothes but I am hoping that by beginning my training with Project333 this summer will help for the winter. We have just come back from two weeks in Turkey. 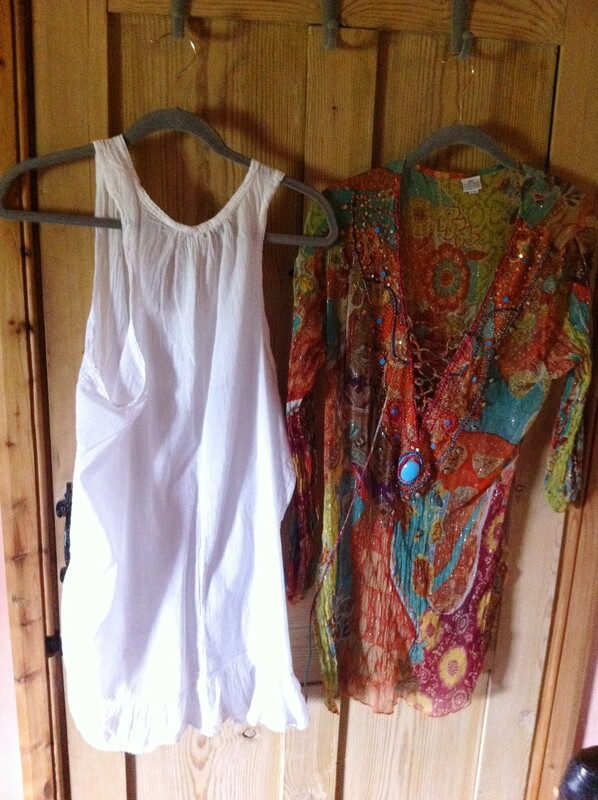 The clothes required for a daily temperature of 30-35 degrees is somewhat different to those required for summer in the north of England (even in our heatwave). I had to make some changes to the 33 items. At first I thought I had failed, but on reflection I decided I hadn’t. 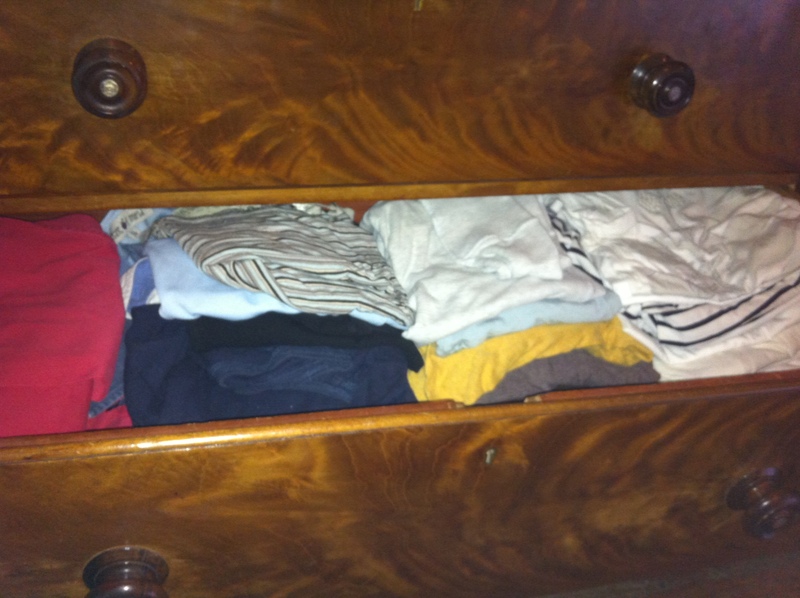 Failure would be to have gone back to my old wardrobe and I didn’t do that. So this is was what I did. On my return I looked at the clothes in my suitcase and put them in three piles. Those that had come from my original 33 items; those that had not and would not return to that pile (beach dress, bikini for example); those that had not but I would like to keep. 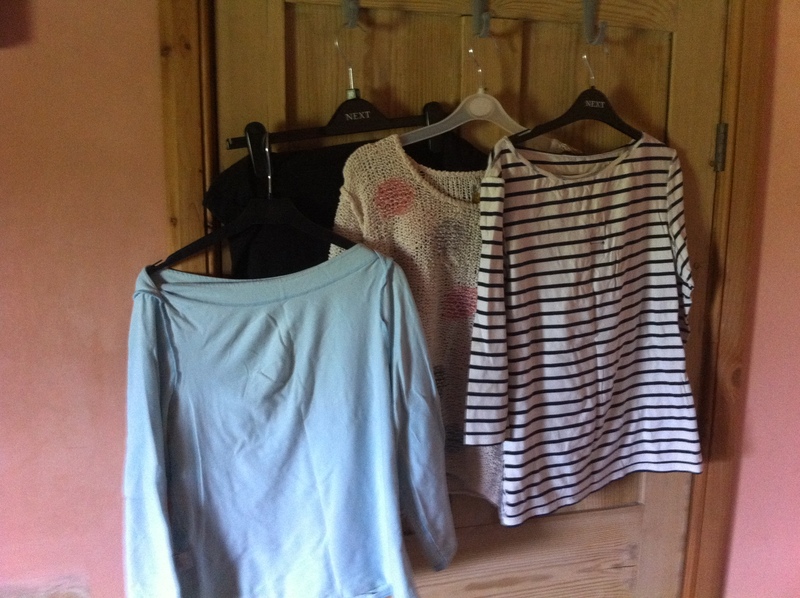 Pile one and three were put in my 333 wardrobe (after washing of course!). 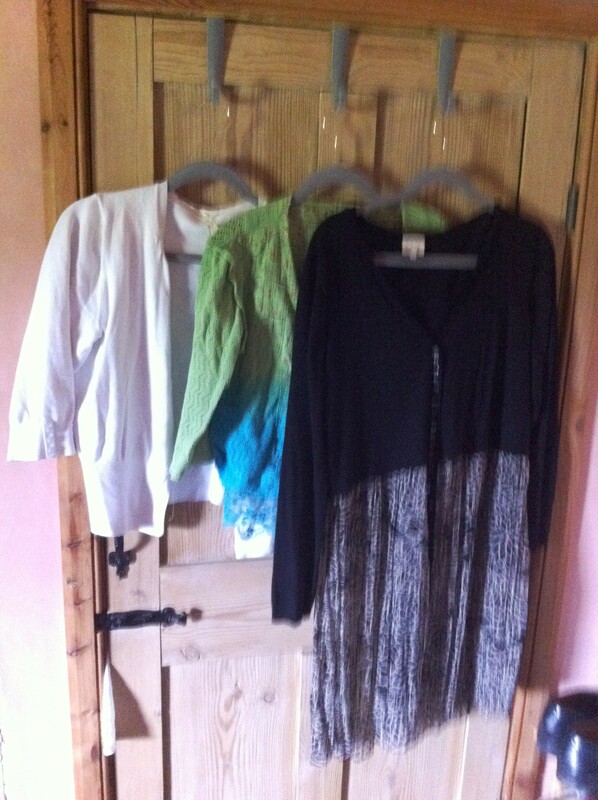 Then I took out of my 333 wardrobe all the clothes that I had originally put in but hadn’t worn. I felt compelled to put in trousers including a pair of jeans because I thought I might need them. But I hardly ever wear trousers. They were returned to the storage wardrobe. Now I dress from the much reduced 333 wardrobe, but if I want to wear something that is not there I take it from the storage wardrobe and return it to the 333 wardrobe after wearing. 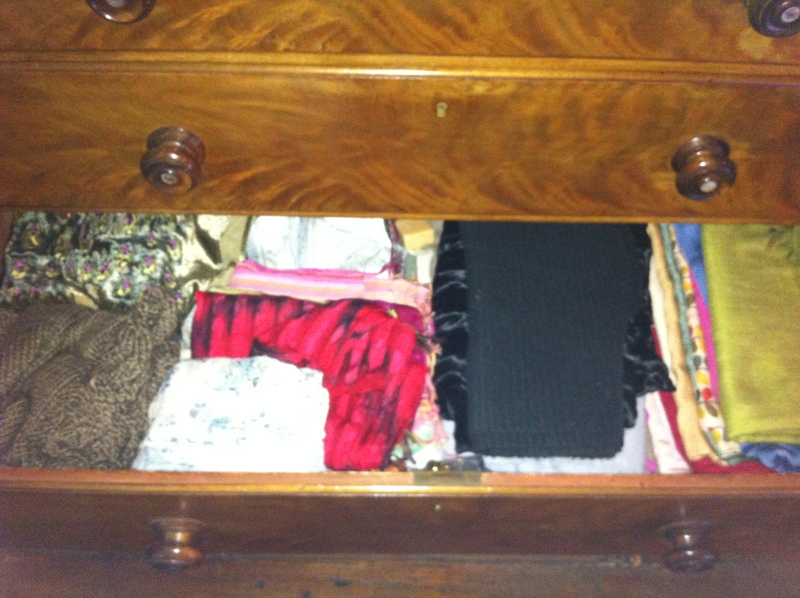 I’m not up to 33 items yet and everything in my wardrobe has earned the right to be there. It is interesting seeing what does go in and I am looking forward to comparing the final 33 at the end of September with the original 33 I chose in July. No posts over the weekend as I am off on a foraging weekend with Taste the Wild. I can’t wait! Head first. That’s the way I usually go. I did that recently when the lovely4 year old daughter of a friend of mine encouraged me to do a forward roll. I am fairly sure that I didn’t break my neck but it was, I feel touch and go. You would have thought I had learned my lesson. Yesterday I worked through the first day of the Project333 programme. What makes this appeal to me is that is isn’t just about creating a capsule wardrobe, but about making you think about what you actually need as opposed to what you thought you wanted. 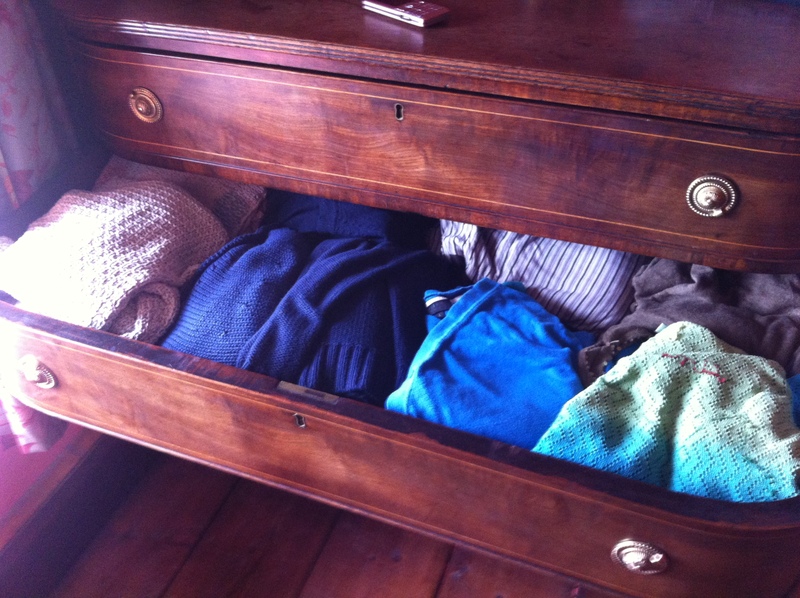 One of the first exercises was to list the items in your wardrobe that you know you will never wear and why you haven’t got rid of them before. In every case my answer was guilt. Guilt that I had spent money on something I haven’t worn and probably will only wear a few times. Guilt because they were presents and I can’t bring myself to get rid of them. The source of the guilt was immaterial. Guilt was the reason. Just writing that down was freeing. I don’t have to feel guilty. 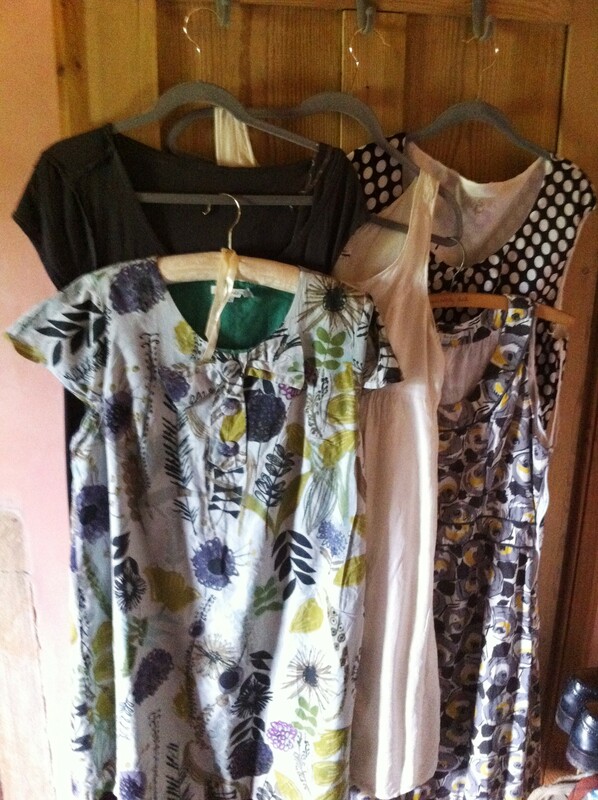 I have forgiven myself for much greater sins than the rash purchase of a dress in the East sale. I have regifted or rehomed any number of presents, why should clothes be different? Another very illuminating question. If you could start over, what would be in your ideal wardrobe? As I listed the items I realised I already owned that wardrobe. Those things were all there but I couldn’t see them for all the other stuff getting in the way. 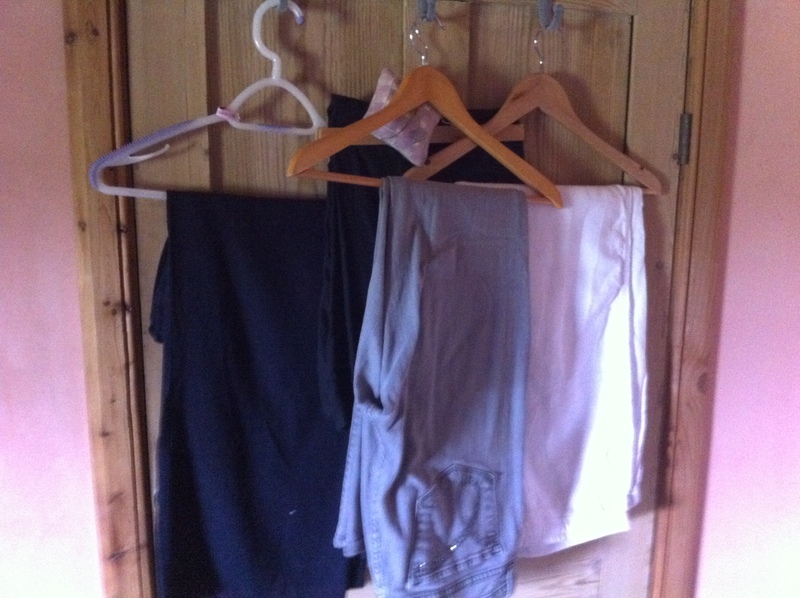 So here is draft one of my capsule wardrobe. Thirty three items not including underwear , gymwear (in my case yoga kit) lounge at home wear (identical to the yoga kit), nightwear (dressing gown and slippers), jewellery worn 24/7 (wedding, eternity and engagement rings, pearl earrings, silver cross, watch and glass bead bracelets) glasses and prescription sunglasses and yardboots for dog walking/gardening/working outside. One leather tote, one cotton scarf, one pair flat sandals, one pair suede wedge sandals, one pair fitflops one necklace one bracelet (7). That comes to 30 – which gives me three more things I can add if and when I need. It was surprisingly easy. Now to see how well I can stick to it! 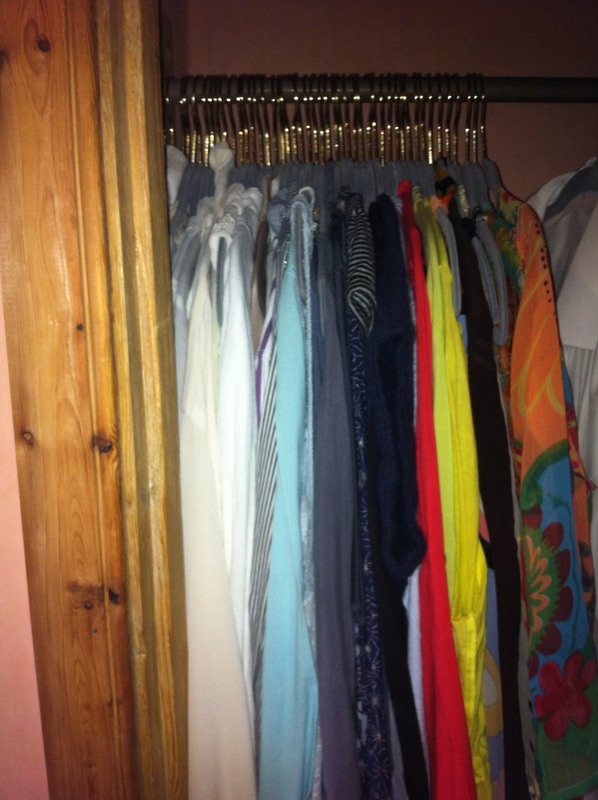 One of the first areas I decluttered was the wardrobe. I was so proud of myself. I was vicious. 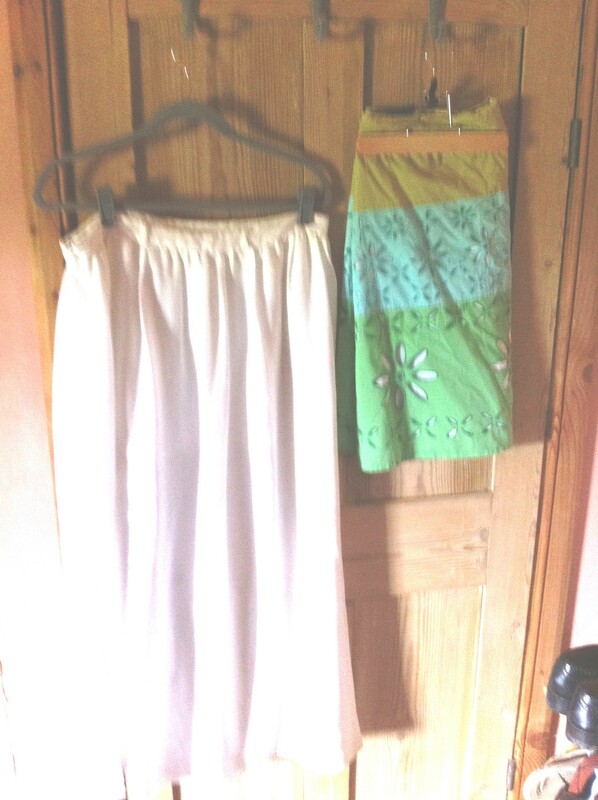 Clothes I had hung onto which I knew even if I could still get into would be as uncomfortable as hell. Clothes which fitted a lifestyle I have long since left. They all went. I moved things around I could see things. Actually it was rather uncomfortable because even though I had got rid of a whole load of stuff I wasn’t sure how happy I was with what was left. With one or two exceptions I wasn’t sure how much I liked them, in one or two cases I wasn’t sure why I had bought them in the first place (or worse I knew precisely why I had bought them and the rationale was rubbish). But a girl has to have clothes and while it might be fine for the Singers and the Dancer to run around in micro shorts and cute little tops. I have a responsibility not to shock the neighbours into an early grave, I have to cover up with something a little more substantial. Or so I thought. No not the size of my clothes, that will remain more or less the same and on the conservative side of decent in the interests of my neighbours’ health. But the amount of them. Despite the recent cull there is still far, far too much in there. Many years ago I was a Weekender’s Clothing Rep. The concept was based around a capsule wardrobe of clothes that could be worn in totally different ways. We did a “show” with a volunteer taking them through a whole luxury weekend from dinner to walking in the country to lying by the pool with only a tiny bag of about 4 jersey items. The bag turned into a waterproof jacket. It was fun but I wasn’t sure I could really go away for a weekend with just that bag. The company has gone out of business now and I regret not keeping that kit. It was the epitome of versatility. Then I came across Project333. Live for three months with only 33 items in your wardrobe (there are some exceptions). No way, I thought. Why not, I thought. Go for it, I thought. There I have said it, in public. I am going to cut down my wardrobe to 33 items and live with just them for July, August and September. Two weeks ago I would never have even dreamed of taking up this challenge, but that’s what happens when your mindset goes off on a wander. It takes you to the weirdest places. In all honesty I am not going to be able to cull quite as drastically as this in 24 hours, but the programme starts today and I’ll keep you updated.